The Chicago Metallic 43055 mini cake pan is made of 22-gauge aluminized steel for strength in commercial settings. It has a glaze on the metal that protects it from scratches and stains. 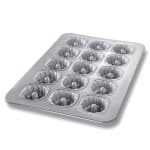 Since there is a wire in the rim, this pan is ideal for use in pan racks for transporting or storing. The Chicago Metallic 43055 mini cake pan makes 15 mini bundt cakes, muffins, and more with a fluted design on the exterior. Overall dimensions: 177⁄8 in. x 257⁄8 in.